Last Tuesday night, Joe Erwin addressed our Successful Entrepreneurship seminar with powerful testimony of what he feels has given Erwin Penland national prominence in the advertising field. Going from zero to 400+ staff members and hundreds of millions in marketing business is a compelling story, especially when the speaker is telling the story in the first person, and he is named Joe Erwin. Afterwards, the crowd was more than simply motivated. They just could not stop talking about it—even a week later—because Joe’s story was such a clear example of achievement and overcoming all types of setbacks. Exactly what is a BHAG? In Joe's words, it’s a “Big Hairy Audacious Goal.” Specifically, a BHAG is a concept put forth in the 1994 book, “Built to Last: Successful Habits of Visionary Companies” by James Collins and Jerry Porras, which challenges businesses to set a 10- to 30-year goal, similar to a self-challenge when your current status quo is nice, but you can stretch yourself to achieve something big and special. The morning after Joe’s presentation, my partner and Serrus CEO, Steve Mudge, called all of us together. Basically, he told us that we are doing great, but he had a question for everyone: what is our BHAG? The whole team was excited! We are all goal-oriented, and these folks have created most of the value that we have built. Immediately, we formed a group that will meet to discuss our business’s culture and set a BHAG. Our new big goal is starting to be framed up here at Serrus, and we all feel the energy and motivation. I love it. Also, this morning I got an e-mail from Elliott Davis managing partner Rick Davis containing a press release about Clemson being named the 21st Best Public University in America by US News & World Report. Rick wrote, "This demonstrates the power of a vision." In fact, I remember when Clemson President Jim Barker brought out this BHAG. Back then, folks made fun. There are far less doubters this morning. Finally, last week, a 64-year-old woman named Diana Nyad became the first person to swim without a protective cage from Cuba to Florida across 100 miles of ocean. It was her fifth try. When she got out of the water, exhausted and exhilarated, she said this: "I’ve got three messages. One is we should never, ever give up. Two is you never are too old to chase your dreams. Three is it looks like a solitary sport, but it is a team." Her BHAG seemed ludicrous to others when she set it and seemed more ludicrous after each failure. Ms. Nyad, however, kept reaching for that Big Hairy Audacious Goal until she made it. Businesses should take note. In my humble opinion I believe that leadership is from the front. Winners like Joe Erwin, Steve Mudge, Jim Barker, Rick Davis, and Diana Nyad lead us by example. It challenges our spirit and we dream again. What's my Big Hairy Audacious Goal? Stay tuned because I have one that I've been working on and will share. There's a pretty good chance I will embarrass myself, and my timidity causes me to first convince myself that it’s a possibility even before I fire off the rockets. The only hint is that it involves a bicycle. So, in the spirit that life is not a dress rehearsal: what's your BHAG? Greenville, SC – Upstate business leaders today announced program plans for a new three month “Successful Entrepreneurship” lecture series. The innovative opportunity developed by industry influencers and experts will rely on a grassroots-based curriculum to inspire innovation and encourage individuals to develop ventures that benefit the local community. Thought leaders representing a continuum of markets will share their experiences, testimony and insight, giving proven advice on ways to successfully foster business ventures. Topics to be discussed include marketing, social media, financial and accounting basics, human resources, leadership and international business. Leighton Cubbage, chairman of Serrus Capital Partners, said, “the Successful Entrepreneurship series aims to gather the top thinkers in the Upstate, drawing on their expertise and wisdom to share insights with up- and-coming entrepreneurs. This is a tremendous learning opportunity and I’m confident that this will become a growth engine for the Upstate.” An evolution of Ecoplosion, the Successful Entrepreneurship series demonstrates our business community’s ongoing commitment to foster new development in the Upstate. The program will meet weekly beginning on August 27th and will run until December 11th. Registration is limited to 75 and participants in the free lecture series will receive a certificate of completion at the end of the program. For more information and to register visit www.successful-entrepreneurship.com. ABOUT SERRUS CAPITAL PARTNERS ￼Serrus Capital Partners combines real estate developers, entrepreneurs and financiers to manage capital wisely while growing a portfolio of properties strategically. With decades of collective experience across multiple industries, Serrus Capital is the area’s leader in real estate asset investment and management. To read or download the official release in PDF format, CLICK HERE. It was just last summer and the Residences at Biltmore needed more than a vision, they needed a partner. The project was bank owned, there were 50 units sitting dark without any furnishings, and the project was lacking a vision for the future. When you walked inside the properties you found something similar. The Community Owners Association was lacking sufficient plans and budgets to create a long term sustainable project. You could see this when you walked to the pool. The pool bathrooms were originally planned but never started. Now, a year later, we have lots to cheer about. Today the units are completely furnished creating that sense of home away from home. The facilities at the pool have been completed and now there is even discussion about an additional pavilion area. The Community Owners Association Board had a 3rd party reserve study executed. What does this mean? This created the financial resources for future capital expenses to keep The Residences at Biltmore one of Asheville's most attractive destinations for years to come. Now, the individual unit owners and Serrus Capital Partners are working together to carry out that vision. This vision has re-established The Residences at Biltmore as a special place to call home. If you would like to visit for a weekend getaway or want consider The Residences at Biltmore a place to call home, we hope you will come join us. Go to ResidencesatBiltmore.com to schedule a visit! Vacation with me takes a special person. Recently, on the first day of our annual week off, I awoke before 6:00 a.m., still feeling the normal pressure of wanting to work. And I did work. The second day was more of the same. When all my tasks were over, and I had completed one last conference call from Greenville, I looked at my wife Tammy and said, “I’m about out of “To-Dos.” She gave me an incredulous look and said, “Yeah, that’s what vacations are actually for.” Well, I get that, but if you are wired like many of us, sitting around is not a reward. In fact, that is why retirement is not what it’s cracked up to be. So I just kicked into my basic default setting and began to build a list of new things to do. First on my list was renting a couple of bikes and a Jeep, and then I plotted everything possible of interest that we could see or experience. As the week moved along, I found it easier to read all my newspapers and websites each day and not be rushing to go anywhere. By the time the full week was over, I felt like a different person. In fact, another week wouldn’t have been so bad. It seems I wasn’t waking up before 6:00 a.m. anymore. And I didn’t mind watching a few mindless TV shows. I was a new man! Asheville is absolutely relaxing. In fact, Residences at Biltmore is far more wonderful than just the financial rewards we like as investors. Tammy and I love it. These are first-class units. All are comfortable and stocked with great kitchens. Those super plush sheets on the bed make a difference. The views are beautiful, and you can actually walk to the world-class restaurants, shops, and galleries in historic Biltmore Village. Escaping the sweltering heat and humidity of summer, Asheville has perfect mountain summer weather. Bike trails are everywhere, and someone close to me told me that there was great shopping there. At night, the view and the feeling around the outdoor fire and waterfall at the pool is fantastic. My suggestion is get some time off, pick a one, two, or three-bedroom unit and go up and enjoy the solitude. And, oh yeah, leave your “To Dos” at home. You won’t need them. Here are a few pictures, just incase you were wondering. 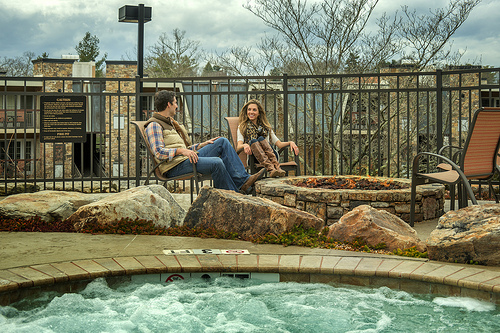 Also...here is the website: www.ResidencesAtBiltmore.com. Enjoy! Before you are a leader, success is all about growing yourself. When you become a leader, success is all about growing others. – Jack Welch Leadership is an integral component of every successful business. In this day and age companies simply do not luck into success, growth, and profits. Leaders are looked to when things go right and likewise when things go wrong. The intangible characteristics of a leader can be difficult to distinguish. Some leaders command respect with their demeanor while others earn respect through their actions. Often the very best leaders are able to wear many hats, changing personas to bring the best out of their employees. As Jack Welch adeptly pointed out, a successful leader is able to grow others. Serrus Capital Partners has been blessed with an abundance of leadership. In my nearly three years with Serrus I have been both challenged and encouraged, knocked down and picked up, embattled and rewarded. The rigors of a MBA prepared me for the conceptual problems a manager might face; however, my real growth has come from working with leaders that have helped to bring out the very best in me. Being a leader is not a position of self-promotion; it is a position of self-sacrifice. The time that is given to explain how and why a decision is made rather than just making a decision is the difference between giving a man a fish and teaching a man to fish. The lessons I have learned working for Serrus will prove to be enduring, of that I am sure. And that is leadership 101. We believe in today's environment, it is important to verify our numbers. We are in a trust and verify environment, so it is important to have our numbers audited one a regular basis. Here is a short video with Chief Financial Officer Ed Blakemore talking about the Serrus commitment to financial accountability. Serrus owns a substantial amount of condos right across from Williams Brice stadium. Check out Carolina Walk. This story is not about real estate. But, about the pain of game a played there when I was 20 years old. It was mostly delivered by a twisted family of Gamecocks I grew up with in evidently the wrong part of Sumter,SC. You see I actually grew up with the infamous Moise family . They are all very unique people. All of them are helpless, avid and rabid Gamecocks. Warren and Scott are brother and sister and are even ranked as two of the nation’s top attorneys. Scott is with our Serrus law firm of Nelson Mullins. Warren writes legal books and is a top litigator. Their brother Ben Moise is a retired game warden and a Charleston legend. He’s about the most likeable person on earth. The other brother Mike Moise is a retired coach. To say he is competitive is like saying Coach Spurrier is laid back. The story will make sense in a minute. You will be shocked what these people did. Now growing up around these folks and spending about every day with Warren was not easy for a boy from the orange world. To complicate things, their dad was Robert Moise. He was a captain of the Clemson basketball team. Even though he was super successful many of his dollars went to Carolina for tuition with his wayward children. ( We’ve only had four kids at Carolina.) These folks are all very intelligent and collectively are very dangerous to the simple Cubbage thoughts. Case in point, in 1973 as a serial bench warmer for the Fighting Tigers these folks delivered a life changing public challenge to my self image. During the first half of the Clemson Carolina game that was held in Columbia in 1973. I heard from the PA system: “Mrs. Leighton Cubbage….Mrs. Leighton Cubbage… your purse has been found.” I didn’t hear much after that as fellow bench warmers were laughing at me. I came out of shock and told them it must have been a mistake and that my momma was there and they must have gotten us mixed up. Second half and Clemson is getting beaten, unfortunately like I’m reminded of in recent history, and again it’s: “Mrs. Leighton Cubbage …your purse has been found.” This time I just cringed as the mood on getting beat at Carolina was not a place for big laughs or smiles. After the game as I trotted towards the visitors’ locker room I heard from the top of Williams Brice stadium….”CUBBAGE!!!!!”. I looked up and then heard them scream two words I’ll never forget: “YOUR PURSE!”. I knew instantly it was the dreaded Moise gang. They had overwhelmed me with a purse with fake ID, some cash, cards, and various make up. They turned it in to have my name blasted in shame. When I got home to Sumter for Thanksgiving I learned of another great moment where I wanted to hide. My brother told me how our mother Margaret Cubbage, who was an original diva, didn’t care about the purse and figured it wasn’t hers. And yet the worst thing was what she was doing. As the Clemson side got quiet she began to scream for the coaches to put Leighton in the game. And saying that I couldn’t do any worse than the starters. I’m cringing typing this. For me personally, whatever happens in this year’s game can’t be as bad as one I lived through. Our governor has consistently prioritized job creation and putting SC back to work – growing our economy and adding stability to our state. Serrus Capital Partners and its professional team is dedicated to helping SC succeed, investing capital to generate jobs, stabilize communities and provide quality homes to hard working families. Listen as Nikki Haley shares that vision for SC and how government is working to help businesses excel. To learn more about Ecoplosion and go to Ecoplosion2013.com.